The EU licensing authority has approved this technology the Mercedes Benz S Class is now the first car to feature this innovative technology. Studies on braking signal system documented in EC Standards can be found at TRABS-WP29-GRE-52-35e and TRANS-WP29-GRE-53-02e. ABL is a device designed to alert rear following drivers to the danger of rear-end or chain collision. It is proven that driver reaction times are shortened by up to 0.2 seconds if a flashing red warning signal is given instead of the conventional brake light during emergency braking. With mostly drivers not concentrating on the road, it is not easy to identify an emergency braking. ABL can effectively contribute towards the prevention or reduction in rear-end or chain collisions by means of flashing brake or flashing brake and hazard lights. Research has shown that at speed of 60 km/h, the reaction time to brake is 0.6 seconds with conventional brake lights and a similar reaction time of 0.6 seconds with manually switched ON hazard lights. With the ABL, the reaction time is significantly reduced to 04. seconds only. At a speed of 80 km/h, this reduces the stopping distance by approximately 4.40 meters and at 100 km/h by no less than 5.50 meters. 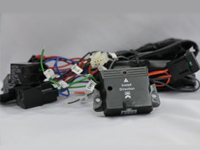 ABL utilizes the latest Deceleration Sensing Technology to sense the deceleration force or Gravity Force of the vehicle whenever the brakes are applied. The system has the abilities to analyze whether soft braking or heavy braking is intended by the driver. If the deceleration force is confirmed to be greater than -6m/s² or Gravity Force of 0.60G, the system will trigger the flashing brake lights and when its greater than -8.5m/s² or 0.85G, the system will trigger the flashing of brake and hazard lights together at different Hertz to clearly alert the rear following driver. This will drastically assist in braking on-time in such sudden-braking especially during high speed driving on expressways. This versatile device has 3 levels of visual warning that will continue to flash until deceleration speed is decreased to -5m/s². Tell us the model you need!